Thatcher’s last journey through London? Not having paid much attention yesterday to the Thatcher Funeral, and being a very inept Googler for information about such things, I am unsure about just what this is a photo of. The internet is full of news about what happened yesterday, but seems (to me) to be silent about any Thatcher related activity happening in London today. Baroness Thatcher was this afternoon cremated at Mortlake Crematorium in South-West London. After a reception for the guests at her ceremonial funeral, the body of the former Prime Minister was driven from St Paul’s Cathedral to the suburban district. Her ashes are due to be interred next to those of her beloved husband Denis, who died in 2003, at the Royal Hospital Chelsea. The hearse in the photo that my friend took certainly looks like the hearse on duty yesterday, as featured in the pictures at the far end of the link above. And who else, besides Thatcher, would merit a Union Jack? So I’m guessing that this was indeed the Thatcher ashes, on their way to Royal Hospital Chelsea. If so, by a somewhat circuitous route, back through the middle of London. But am I right about what this was? Or is egg is even now assembling itself on my face? 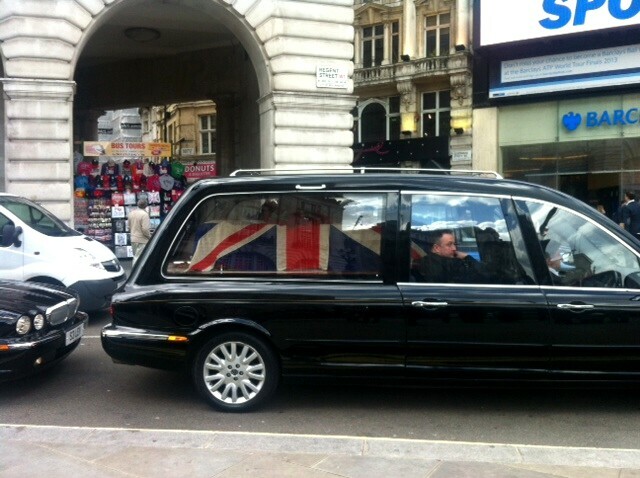 7 comments to Thatcher’s last journey through London? My guess (it is no more than that) is that you are correct. I’m looking to make some sort of quip about The Ashes, but it wouldn’t be cricket to do so. Did the route back go past the Ritz in Piccadilly? The funeral is on the BBC iPlayer, along with Dimbleby’s surprise, perchance horror, at the turnout, and his string of absurd comments, still there for a few days. The Standard had given itself over to coverage of the funeral and Mrs Thatcher’s impact on London. I walked past the Ritz that afternoon, and gave a short bow for the good done. That certainly looks like the car that carried the coffin, the flower bouquet matches, and perhaps the Jag behind holds the family? A quick question–I visited a pensioner at Chelsea (a long interesting story, if you are interested) and saw a lot of things there–but I don’t remember a mausoleum. Why would her ashes be being taken there? Larry Mrs T. was a regular visitor to the Royal Hospital (old meaning of the word “hospital”) Chelsea. Probably a military man (or woman). Can’t be Mrs Thatcher if she was cremated the day before. I think there is a small cemetary by Chelsea Hospital and Dennis Thatcher is buried there.